San Francisco’s coveted Treasure Island Music Festival will see deadmau5, Robyn, Chvrches, Gorgon CIty, Cashmere Cat, Viceroy, STS9, Hudson Mohawke, Skylar Spence, Panda Bear and Bob Moses representing the event’s electronic music contingent this year. 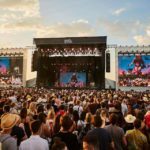 The two-day festival, produced by Noise Pop and Another Planet Entertainment, has arguably surged in terms of dance music acts compared to previous years, which in the past provided more emphasis on rock, indie, and hip-hop. Following deadmau5’s live debut of his new Thunderdome stage at Governors Ball, expect to see Joel’s new structure make its way to San Francisco in October. Tickets for Treasure Island go on sale this Thursday, June 11, at 10:00AM PST. See the full lineup below.